Thank you to all of the Participating Contractors who attended the 2018 Program Year Kick-Off on January 16! We hope you gained valuable knowledge about all of the incentives available for 2018. Please visit the Program Resources: Past Training Presentations of the Contractor Website to find copies of the presentation slides. 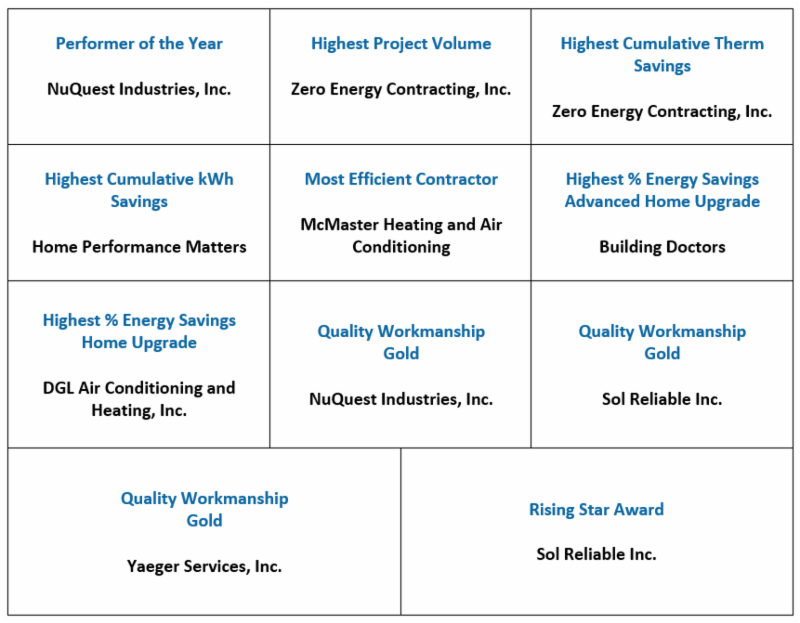 Last year the Program witnessed many great accomplishments by contractors who made energy efficiency, customer satisfaction and quality the cornerstones of their business. We're pleased to announce the 2017 Contractor Appreciation Award winners! The Contractor Participation Agreements and Home Performance with ENERGY STAR® Addendum have been updated for 2018. These documents must be initialed and signed by a representative of your company in order to participate. In order to ensure that ineligible projects do not tie up reserved incentive funds, the Program is now instituting a 90-day project cancellation policy. If a project has not been completed within 90 days from the project reservation date, the project is subject to cancellation by the Program. Participating Contractors at risk of getting their projects canceled will be notified well ahead of time so that they are able to take action to prevent this. Please contact your Account Manager if you have any questions or concerns about any at-risk projects. Contractors can no longer claim heat pumps in the Home Upgrade Pathway for 2018. However, heat pumps are available in the Advanced Home Upgrade Default and Custom paths. Heat pump pre-retrofit photos will now be required on all projects. Please contact your Account Manager if you have any questions about pre-retrofit photos for Advanced Home Upgrade projects. An updated Snugg Pro Modeling Guide is now available on the Contractor Website. 1.29 shall be used. This energy factor is based on the Database for Energy Efficiency Resource (DEER) values. 691 kWh/year shall be used. This energy factor is based on DEER values. 0.62 shall be used. This energy factor is based on DEER values. If you plan on using OptiMiser to model your Advanced Home Upgrade projects, please contact your Account Manager for further assistance. Please note that the updates listed for the SCE/SoCalGas Program above also apply to the SoCalGas-only Program. If you have any questions, please contact your Account Manager. For all Advanced Home Upgrade projects, both therm savings and electric savings must be achieved in order for the project to be eligible for 100% of the final incentive. In SoCalGas/LADWP territories, customers are eligible for 65% of the final incentive for Advanced Home Upgrade projects that only produce electric savings and 35% of the final incentive for projects that only produce gas savings. In SoCalGas/municipal electric provider territories, customers are not eligible for incentives for Advanced Home Upgrade projects that only produce electric savings. REEL: What Measures Can Be Financed? You heard about the latest Residential Energy Efficiency Loan (REEL) program updates at the January Technical Meeting-but what measures can be financed? EEL can finance all Energy Upgrade California® Home Upgrade measures, as well as additional Eligible Energy Efficiency Measures (EEEMs). The full list includes air sealing, appliances, cool roofs, duct sealing, HVAC, insulation, lighting, pool pumps, water heating, windows and more. The updated searchable list and downloadable PDF include measure specifications. REEL pairs with Home Upgrade by giving homeowners the flexibility to add measures without adding up-front cost. To learn more about REEL, visit https://www.thecheef.com/contractors. Happy New Year! Thank you to all of our Participating Contractors for making last year so successful by providing homeowners with energy efficiency improvements and more comfortable homes. Your active participation has made for the great success of the Energy Upgrade California® Home Upgrade program in the Southern California Edison (SCE) and SoCalGas® service territories. We can't wait to see what we can all accomplish in 2018. Below are program updates to get things started! Program Changes Reminder: Thank you to everyone who joined our Program Changes webinar on December 13 to learn about and discuss the new program requirements. Please refer to the Program Changes Quick Reference Guide for a detailed description of the new program requirements. The SCE/SoCalGas program is currently updating all program documentation for 2018. Further information about new documentation will be shared at the Mandatory Program Kick-Off Event on January 16 (more information below). The Efficiency First (EF) program with Home Depot has been significantly enhanced with the addition of benefits from the Building Performance Institute (BPI). BPI is now offering a credit for all BPI products and services for EF members who register for the program and spend at least $10,000 at Home Depot during the year. Register now and get credit for all the purchases on the associated account dating back to January 1, 2017. 1. All EF members who purchased at least $10,000 at Home Depot during 2017 using the associated account will earn a credit for all BPI products and services worth 1% of their purchases. 2. All EF members with at least $30,000 in qualifying Home Depot purchases during 2017 will earn free EF membership for a year AND a credit for BPI products worth 1% of their purchases, so at least $300. 3. All EF members with at least $100,000 in qualifying Home Depot purchases during 2017 will earn free Efficiency First membership for a year, free registration at the HPC National or Regional conference of their choice, AND a credit for BPI products worth one percent of their purchases, so at least $1,000. After registering, Home Depot will track purchases for the year using the credit card that associated with the EF code. At the end of the year, Home Depot will compile all purchases using the EF code and provide the association with rebate funds. Register now and get credit for all purchases on the associated card dating back to January 1, 2017. Please register today Here! When performing diagnostic testing on homes with fireplaces, it is important to visually inspect the chimney damper. Over the years, there have been many different types of chimney dampers used. One thing that most of these dampers had in common was that they were in the top of the fire box and closed off the chimney from the bottom. These typical dampers are normally just a flat piece of steel attached to a pair of pivots that allow the damper to open and close. As simple as they are, dampers are still prone to damage. Depending on the fire, flue temperatures in the vicinity of the damper can be more than 500°F. Over time, intense heat can take its toll on the damper, rendering it useless to the point where it may be damaged or stuck in a particular position. Recently, QC inspectors have seen a handful of chimney-top dampers. These new-style dampers differ greatly from traditional dampers in the fact that they mount to the top exterior of the chimney. Most of these dampers were installed when the original damper was damaged, stuck in the open position, or removed. Chimney-top dampers have the advantage of ease of installation since mounting them on a variety of chimney configurations is quick and simple. Program guidelines dictate a gas fireplace must have a minimum ½-inch opening between the damper and the fireplace when the damper is in the closed position. This requirement is applicable in the case of a chimney-top damper and there are various ways to achieve this. Depending on the configuration of the unit, a clamp or a bolt may be used at the chimney-top to keep the chimney-top damper from closing completely. Another method to keep the damper open would be to adjust the cables (that open and close the chimney-top damper) hanging in the firebox so they leave the chimney-top damper open at least ½-inch. Next time you run across a gas fireplace with a damaged or missing damper, be sure to check the top of the chimney to see if a chimney-top damper has been installed. If a chimney-top damper has been installed, verify that it can be blocked open at least ½-inch. If it is not in the required fixed position when it is shut, modifications must be made to meet the Program requirement. When it comes to energy-savings calculations and health and safety matters, precise measurements are key. Without taking the time to verify proper measurements, it's hard to know if your results are accurate. Two measurements that have a direct bearing on mechanical ventilation (MV) requirements are conditioned floor area (CFA) and average ceiling height. When either of these two measurements are incorrect, the need for a MV recommendation or requirement may not be called out in a situation where it should be. For this reason, the Program has instituted a change regarding CFA and ceiling height measurements for Home Upgrade projects (Advanced Home Upgrade projects are not affected by this change). In the past, when a Home Upgrade project was chosen for on-site post-verification, the Energy Field Technician would use the contractor's measurements for CFA and average ceiling height. After inspecting numerous projects, it has become apparent that either CFA or average ceiling height have been measured incorrectly in a portion of the projects. For that reason, a new policy has been instituted that requires the measurement of CFA and average ceiling height when the contractor's measurements are questionable during the post-verification. To assure the most accurate measurements possible, make sure you are measuring the home based on Chapter 12 of the Inspection Guidelines v7.0, measure wall linear dimensions and ceiling heights for each ceiling configuration. Do not rely on websites such as Zillow or Redfin for conditioned floor area and use the dimensions tab of the QC Tools Calculator located on the Program website to determine average ceiling height. Marketing materials are now being handled by the statewide Energy Upgrade California® brand team. Currently, no new program marketing materials are available. Please continue to use existing program materials, as well as the materials provided by Home Performance with ENERGY STAR® when selling the program to your customers. We will update you with additional information on this topic as it becomes available. 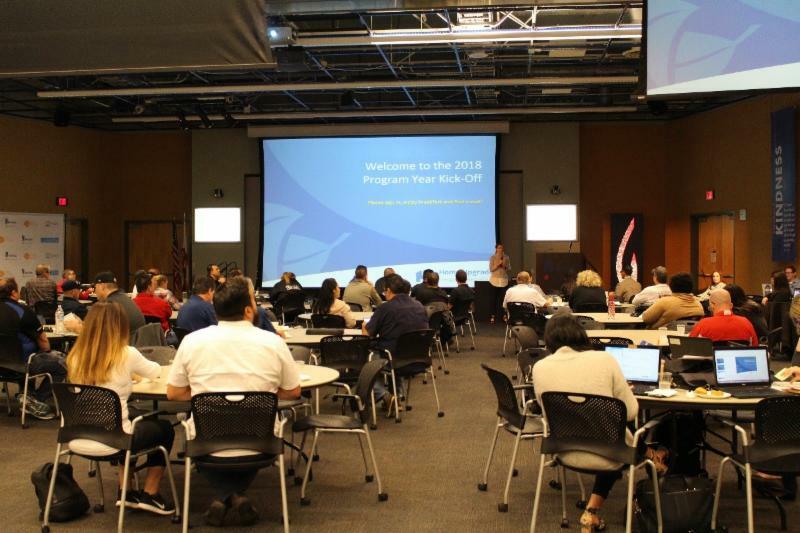 Please register for our upcoming mandatory kick-off event at the Energy Resource Center. The kick-off event will cover the future of the Energy Upgrade California Home Upgrade Program for 2018 and celebrate contractor achievements and accomplishments from 2017! We appreciate and recognize all of your hard work and look forward to celebrating your success with you. Greetings to all Participating Contractors in the Southern California Edison (SCE) and SoCalGas® Energy Upgrade California® Home Upgrade Program. Thank you to all contractors who have been actively inquiring about the Program and staying up to date with their account management teams. Below are important updates regarding 2018 Program incentives. As always, reach out to your account management team with any questions. The Home Upgrade/Home Performance with ENERGY STAR® joint program between SCE and SoCalGas will begin accepting reservations again on January 1, 2018, on a first-come, first-served basis for a short period of time (due to limited budget). Incentives will be offered on approved projects where measures are purchased and completely installed after January 1, 2018. SCE will monitor incentive reservations closely and will communicate with Participating Contractors on an ongoing basis. Once the funds have been reserved, it is anticipated that the Program will stop accepting new applications through the end of 2018. A code change has impacted the minimum specification requirements for the duct leakage measure. In order to claim duct leakage as a measure in the Home Upgrade Pathway in 2018, contractors must seal to ≤ 10% (duct leakage to outside) OR seal to ≤ 5% (duct leakage to outside). A CF3R, CFM25 result or a date stamped photo of a CFM25 result may be submitted to meet the duct leakage requirement. If a CF3R is submitted, quality control duct testing will be streamlined if the project is chosen for inspection. Please note that this update listed for the SCE/SoCalGas Program above also applies to the SoCalGas-only Program. Contractors can no longer claim heat pumps in the Home Upgrade Pathway for 2018. Choose the Advanced Home Upgrade Pathway if you would like to claim the heat pump measure. Additional document upload slots have been added in all of the statuses for contractors! Please note that this update listed for the SCE/SoCalGas Program above also applies to the SoCalGas-only Program. All Advanced Default path projects that do not submit utility bill data shall use a default energy factor of 1.29. All Advanced Custom projects that submit utility bill data shall submit the actual energy factor supplied by the clothes washer manufacturer. If the energy factor is not available, the default value of 1.29 shall be used. This energy factor is based on the Database for Energy Efficiency Resource (DEER) values. All Advanced Default path projects that do not submit utility bill data shall use 691 kWh/year. All Advanced Custom projects that submit utility bill data shall use the actual energy in kWh/year supplied by the refrigerator manufacturer. If the kWh/year is not available, the default value of 691 kWh/year shall be used. This energy factor is based on DEER values. All Advanced Default path projects that do not submit utility bill data shall use a default energy factor of 0.62. All Advanced Custom projects that submit utility bill data shall submit the actual energy factor supplied by the dishwasher manufacturer. If the energy factor is not available, the default value of 0.62 shall be used. This energy factor is based on DEER values. Contractors should refresh all models at post-retrofit submission to ensure the energy savings are accurate and to avoid potential appeal issues. Please note that this update listed for the SCE/SoCalGas Program above also applies to the SoCalGas-only Program. SoCalGas would like to confirm that the Home Upgrade/Home Performance with ENERGY STAR Program will continue to be offered in 2018. The Program will begin accepting reservations again on January 1, 2018, and will offer incentives on approved projects where measures are purchased and completely installed between January 1 and December 31, 2018. The Program will remain open through December 31, 2018 or until incentive dollars are exhausted-whichever comes first. SoCalGas will monitor incentives closely throughout 2018 and will communicate with Participating Contractors on an ongoing basis. Information will be distributed via email and posted to the Program website, in addition to updates sent directly from the Program Account Manager. Home Upgrade and Advanced Home Upgrade projects can be offered to your customers who receive gas service from SoCalGas and electric service from one of the municipal electric providers listed below. Please note that projects in the Los Angeles Department of Water and Power (LADWP) service territory will continue to receive 100% of the calculated incentive as long as there are both gas and electric savings associated with the project. Projects served by a municipal utility other than LADWP will receive 30% of the calculated incentive for gas savings. Contractors can no longer claim heat pumps in the Home Upgrade Pathway for 2018. Choose the Advanced Home Upgrade Pathway if you would like to claim the heat pump measure. If a Split or Packaged Central Heat Pump is replaced as a part of an Advanced Home Upgrade Default or Custom Project, an image of the existing dataplate and a photo of the new dataplate is required. For all Advanced Home Upgrade projects, therm savings and electric savings must be achieved in order for the project to be eligible for 100% of the final incentive. In SoCalGas/LADWP territories, customers are eligible for 65% of the final incentive for Advanced Home Upgrade projects that only produce electric savings and 35% of the final incentive for projects that only produce gas savings. In SoCalGas/municipal electric provider territories, customers are not eligible for incentives for Advanced Home Upgrade projects that only produce electric savings. Thank you for your participation in the Historic Building Energy Efficiency Program (HBEEP) throughout 2017! HBEEP projects will no longer receive 100% of incentive in SoCalGas/municipal electric territories. For questions about energy efficiency in historic homes, please contact your Account Manager. HBEEP marketing materials will still be available to assist you in selling to historic homeowners. Save the date of January 16,2018 for our upcoming mandatory kick-off event at the Energy Resource Center! Please be sure to attend the kick-off event to learn what the future of the Energy Upgrade California Home Upgrade Program holds. In 2018, the Energy Upgrade California® Home Upgrade (Home Upgrade) energy efficiency joint program between Southern California Edison (SCE) and SoCalGas® will begin accepting reservations again on January 2, 2018, on a first-come, first-served basis for a short period of time due to limited budget. SCE will monitor incentive reservations closely and will communicate with Participating Contractors on an ongoing basis. Once the associated funds have been reserved, it is anticipated that the program will close to new applications through the end of 2018. SoCalGas® would like to confirm that the Energy Upgrade California® Home Upgrade/Home Performance with ENERGY STAR® program will continue to be offered in 2018. The program will begin accepting reservations again on January 2, 2018, and will offer incentives on approved projects where measures are purchased and completely installed between January 1 and December 31, 2018. The program will remain open through December 31, 2018 or until incentive dollars are exhausted, whichever comes first. SoCalGas will monitor incentives closely throughout 2018 and will communicate with Participating Contractors on an ongoing basis. Information will be distributed via email and posted to the program website, in addition to updates directly from the Program Account Manager. Home Upgrade and Advanced Home Upgrade projects can be offered to your customers who receive gas service from SoCalGas and electric service from one of the municipal electric providers listed below. Please note that projects in the LADWP service territory will continue to receive 100% of the calculated incentive as long as there are both gas and electric savings associated with the project, while projects served by a municipal utility other than LADWP will receive 30% of the calculated incentive for gas savings. 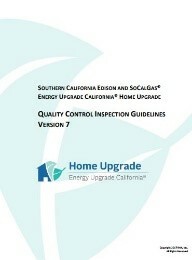 In addition, SoCalGas offers the Home Upgrade program jointly with SDG&E and PG&E. Visit each program's page for additional details. Watch your inbox for information on updated program materials and a 2018 Program Kick-Off Meeting to be held in January. We appreciate your continued support and dedication to bringing energy efficiency to homeowners throughout Southern California. Contact the SoCalGas Program Account Manager with any questions. Greetings to all Participating Contractors in the Southern California Edison (SCE) and SoCalGas® Energy Upgrade California® Home Upgrade Program. Thank you to all Participating Contractors who have made 2017 a very successful year through high participation and strong engagement at Program events! To close out a great 2017, summarized below are important deadlines and tips to make the transition into another successful year as smooth as possible. All projects must be post-retrofit submitted, with all required documentation, by November 15, 2017 6:00 p.m. PST. Additionally, you must resolve all QA/QC issues and documentation issues by December 22, 2017 in order to receive a Notice of Incentive Approval (NOIA) and an incentive in 2017. The Program will not accept any new reservations until January 2, 2018. For 2018 projects, the qualified energy efficiency measures must be sold to the customer, purchased, tested, and completely installed between January 1, 2018, and December 31, 2018, by a Participating Contractor. NO EXCEPTIONS. Below are some tips and best practices to minimize any delays in project processing in order to receive an incentive sooner. Schedule the city inspection for your project before the post-retrofit submission deadline of November 15, 2017. Create a customized checklist of documents needed for each project. The best resource to create a customized checklist is the Incentive Application V10. All incentive applications indicate what is required or recommended based on the scope of work. Name your files descriptively so that reviewers and processors know which document it is before opening it-this helps speed up the review. Including the customer's last name or address in the file name can help you avoid uploading the wrong customer's file. Keep the energy model ID number in the file name when you download the HPXML file from the energy model. You may rename the file from the default file name, but please keep the model job number/ID number in your new file name. Ensure all invoices are itemized and include all measures being claimed for projects submitted to the Home Upgrade Program. Invoices marked "paid in full" should show a zero balance owed. If your invoice also includes other measures/costs not eligible for incentives in the Program, please include a subtotal of the Home Upgrade-related costs on the invoice. Check that the correct customer name, address, service account and dates are listed on the Incentive Application. To reduce any errors, have the utility bills handy to verify the correct information. Include test-in date-stamped images of specific building components and appliances for all Custom Value Advanced path projects. The Advanced Home Upgrade Test-In Photo Documentation sheet here clearly summarizes what is required. Take advantage of workload management reports. Participating Contractors have access to workload management reports in which the project status, project number, premise contact first name and days in status of each project are displayed. To access these reports, log into the WebApp and select a utility provider. 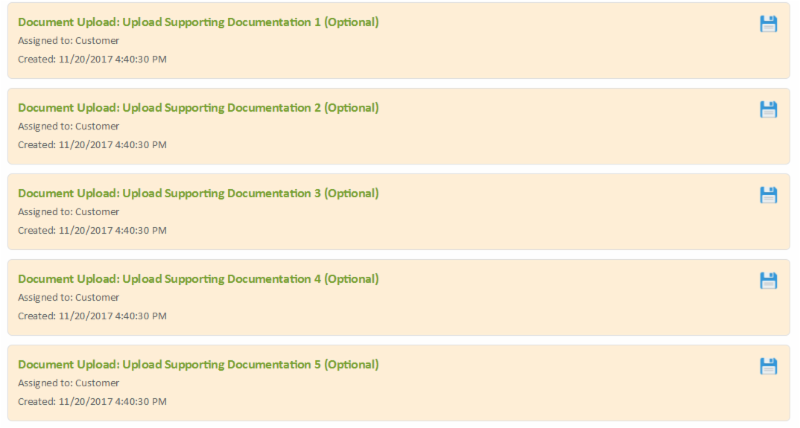 Select "Start Now" in the "View Project Reporting" option.Under "Select Report," choose the appropriate utility. Click "Generate Report" to display the report to easily access important information about your projects. If you have any questions or need guidance on post-retrofit submissions, please contact your account management team. 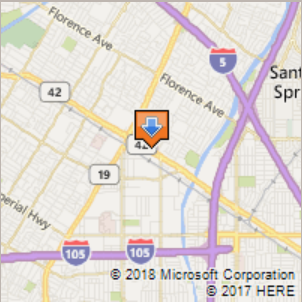 Home Performance Coalition (HPC) Conference & Trade Show Coming Up! 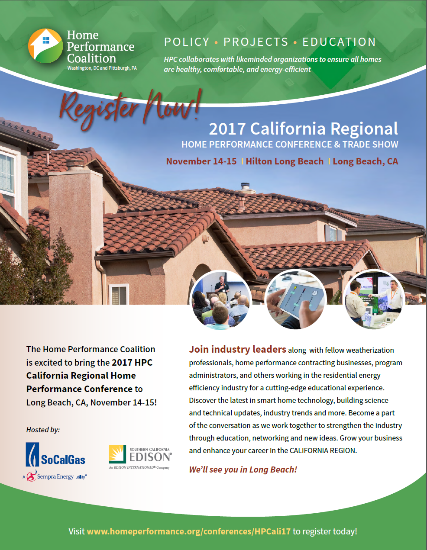 The 2017 HPC Conference is taking place on November 14 and 15 in Long Beach at the Hilton! Click here to register and become a part of the home performance and weatherization conversation as we work together to strengthen the industry through education, networking and new ideas. For more information about the full conference agenda, please click here. Thank you to all Participating Contractors who participated in the HPC Conference Ticket Raffle! Congratulations to our winners of the ticket raffle, Building Doctors and Add Insulation! Up to $50,000 in unsecured financing-no liens. One of the most useful tools for any building performance contractor, HERS rater or BPI Building Analyst is their trusty manometer. Few days go by when the device is not put into service measuring building leakage, duct leakage, worst case depressurization, pressure differentials, exhaust flow, or an array of other pressure and flow measurements needed to ensure that a home is operating efficiently and safely. Just as smart phones have replaced older technology, the time has come for existing manometers to make way for new high-tech instruments. These instruments can perform not only pressure and flow measurements, but also include a variety of connectivity options and a host of other advanced features-making these new devices practically indispensable. The two major manufactures of manometers used by the home performance industry (in no particular order) are The Energy Conservatory (TEC) and Retrotec. 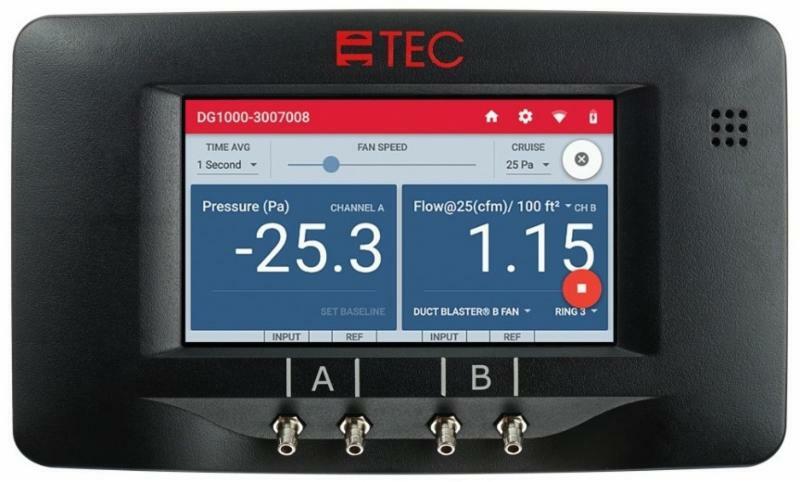 Both companies have introduced entirely new touch-screen manometer/flow meters: Retrotec's DM-32 and TEC's DG-1000. To make these devices even more powerful, each manufacturer offers an app that expands the instruments' capabilities while making operation a breeze. 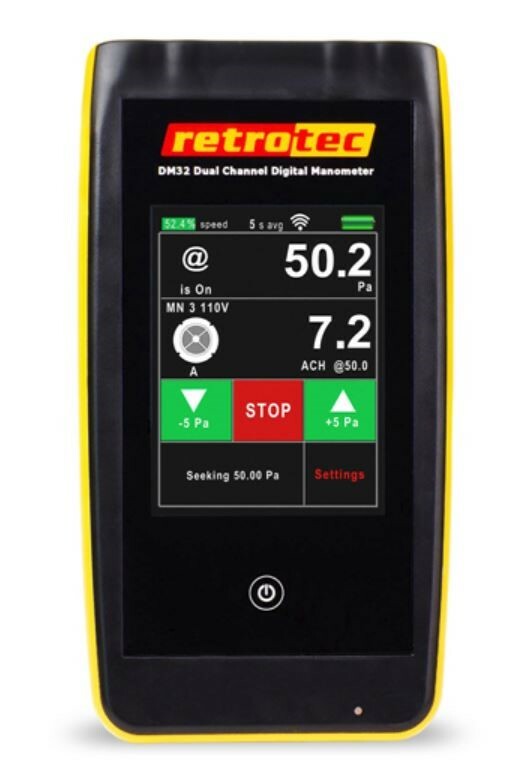 With these new introductions, Retrotec's DM-2 and TEC's DG-700 are no longer available from the manufacturers. By no means is the Program advising you to buy these new pieces of equipment just for the sake of buying them. However, if you are in the market to purchase new equipment, these new tools are worth considering. Keep in mind that Retrotec's DM-32 works with Retrotec equipment and is also compatible with TEC blower doors and duct blasters as well as a host of other TEC equipment. Each company has quite a bit of information online pertaining to the new instruments. In addition, both manufacturers have numerous videos available online describing their new devices. The video links below give in-depth instruction regarding proper use of the pressure and flow gauges in a variety of applications. One of the best ways to stay abreast of upcoming trainings and webinars is to sign up for the company's newsletters (the second link listed under each company). With the holidays rapidly approaching, it would be nice to have a few extra bucks in your pocket. You can do your part to see to it that your customers receive their incentives in time for holiday gifts, parties, home improvements or just to stash away for a rainy day. ICF, RHA and Program management have been hard at work for the last few months assisting Participating Contractors with project completion. The Program has recently communicated the importance of having all projects post-retrofit submitted by November 15 for incentives to be paid prior to year-end. Once projects have been post-retrofit submitted, it's important that Participating Contractors complete their punch lists and address any issues brought up by the Program in a timely manner. Not doing so might keep projects from being processed, and the customer's incentive will be delayed. Your help will go a long way in closing out projects. Our tech reviewers, Account Managers and coordinators have been and will continue to work closely with one another to keep Participating Contractors informed regarding documents, images or any other items that may be required to close out a project. We realize that this will be a busy time for many Participating Contractors as you complete your final projects of the year. By taking the time to supply requested documentation, there is a better chance that all of your projects will close out in a timely manner. Doing so will allow your customers to receive their incentive in a timely manner, and that's a great holiday gift! Greetings to all Participating Contractors in the Southern California Edison (SCE) and SoCalGas® Energy Upgrade California® Home Upgrade Program. Below are important reminders and deadlines, so please read thoroughly and take note. Contact your Account Manager if you have questions about any of the topics. All reservations must be submitted by September 30, 2017 6 p.m. PST. Any projects submitted after this time will not be eligible to participate in the Program for 2017. NO EXCEPTIONS. The Program will not accept any new reservations until January 2, 2018. For 2018 projects, the qualified energy efficiency measures must be purchased and completely installed between January 1, 2018, and December 31, 2018, by a Participating Contractor. NO EXCEPTIONS. Due to the overwhelming success of the Program and limited incentive funds, it is extremely important to reserve and receive confirmation for your projects before you begin construction. Not only does this help ensure that your customer's project qualifies for incentives, it also protects your company from liability and maintains your good reputation with your customers. Please remember the last day to reserve projects for the 2017 Program is September 30, 2017 6 p.m. PST. The Program will resume with new funds in January 2018. Multiple project reservations for the same residence (i.e., dual submission) will not be allowed for projects in both the SCE/SoCalGas and SoCalGas Programs. This went into effect on August 15, 2017. For residences seeking credit for multiple HVAC system upgrades, Participating Contractors should submit a single Advanced Home Upgrade project. The 2017 HPC Conference is coming in November to Long Beach at the Hilton! Click here to register and become a part of the home performance and weatherization conversation as we work together to strengthen the industry through education, networking and new ideas. Grow your business and enhance your career in California! If you have customers who are hesitant about moving forward with a project due to cost concerns, energy efficiency financing may offer an ideal solution. The California Hub for Energy Efficiency Financing (CHEEF) offers the Residential Energy Efficiency Loan (REEL) Program. 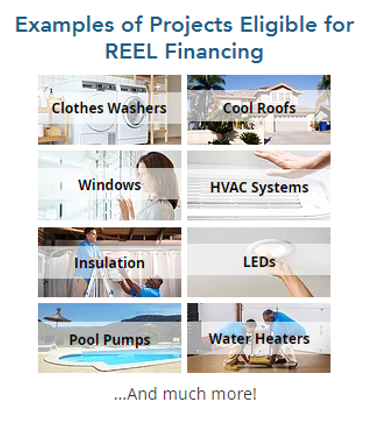 REEL aims at providing attractive financing options to help residential customers complete more energy efficiency home improvement projects. For more information about this Program, view details here! The SoCalGas Program requirements and incentives have been revised to align with the Joint SCE/SoCalGas Program for all projects reserved on or after August 15, 2017 and/or all projects post-retrofit submitted on or after October 1, 2017. More information about the changes that went into effect are located below. Information on these changes is also available under the SoCalGas Program Resources page on the Contractor Website. If you have any questions about the current incentive structure, please consult your Account Management team. Please be sure to use the updated SoCalGas Home Upgrade Incentive Calculator V3 and Advanced Home Upgrade Calculator V8.0, available for download in the Reference Materials section of the Contractor Website. SoCalGas Program Home Upgrade Incentive Calculator v3 must be used for projects reserved on or after August 15, 2017 or post-retrofit submitted on or after October 1, 2017. Projects are only eligible for pre-August 15, 2017 incentives if they are post-retrofit submitted by September 30, 2017 6 p.m. PST. Advanced Home Upgrade Calculator V8.0 must be used for projects reserved on or after August 15, 2017 or post-retrofit submitted on or after October 1, 2017. Projects are only eligible for pre-August 15, 2017 incentives if they are post-retrofit submitted by September 30, 2017 6 p.m. PST. When downloading and opening the Program calculators, please be sure to select "Enable Editing" and "Enable Content" to ensure accuracy of the calculated values. It's hard to believe we are already nearing the end of the third quarter of 2017. Thanks to you, the Participating Contractors and Raters, the Program has come close to or exceeded meeting the 2017 goals. Congratulations and a big thanks to all of you for getting the Program to this point so early in the year. With the end of the year just around the corner, there are still projects pending completion and upgrades to be made. This year the Program instituted changes in the gas leak testing procedures, CAS/CAZ testing guidelines and (soon to be announced) the duct test documentation policy. The gas leak and CAS/CAZ processes were put into place to help contractors/auditors more easily navigate the program and spend less time onsite while still maintaining a high level of safety for themselves, their employees and the occupants of the home. The new duct testing documentation process is designed to allow the QC Inspector to spend less time in customers' homes while still assuring a detailed and accurate duct test is performed. 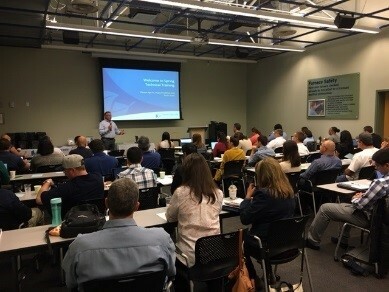 During the June 6, 2017 technical training at the SoCalGas® Energy Resource Center, copies of various documents were distributed. Among the documents were the Inspection Guidelines Version 7.0 and the Processing Guidelines June 2017. We addressed these documents in the July 13 newsletter. After questions from contractors regarding the Inspection Guidelines, we thought a quick review of these documents would be helpful. The Inspection Guidelines V7 (updated June 2017) is designed to help contractors andauditors perform an inspection in the exact same manner as the QC inspectors. When contractors, auditors and QC inspectors complete inspections using the same methods, inspection findings should be consistent. Following the Inspection Guidelines reduces the chance that the QA/QC reviewers will identify an issue that the contractor may have missed or misinterpreted while on site. The Processing Guidelines (updated June 2017) informs the reader about next steps when an issue is identified on a project. While there are multiple sections containing useful information in the Processing Guidelines, there are three sections that should be of particular interest to contractors and auditors: F.) PASS WITH RECOMMENDATIONS (Proceed with Payment), I.) REMEDIATION REQUIRED (Withhold Payment) and J.) FAIL ISSUES (Withhold Payment). Whenever an issue has been identified by an inspector or technical reviewer, look through these three sections, find the issue, and you will know if the issue needs to be recommended to the homeowner as a repair, replacement, or modification, OR if it causes the project to fail and must be remediated to receive an incentive payment. When in doubt, consult the Processing Guidelines and be sure to contact your ICF Account Manager if you need clarification! CO action levels apply to testing under WCD and/or NC. When an appliance fails spillage, or exceeds CO action levels at steady state under WCD, re-test spillage and undiluted CO under NC. The contractor understood item #2 to mean that if the gas log passed testing under Natural Conditions (NC) (which it did), then the appliance would pass-negating the WCD fail-and no remediation would be required. That is not the case here. Based on the table in the Inspection Guidelines that follows #2, if the appliance FAILS SPILLAGE under WCD and the CO reading is >25 ppm, REMEDIATION IS REQUIRED. The reason for testing under natural conditions after a WCD fail is not to get the appliance to pass, but to help the contractor, auditor or technician get a better idea of what is causing the appliance to fail. Is the appliance failure because it was tested under WCD, or is there something wrong with the appliance that is causing high CO under WCD or NC? We hope this explanation gives you a better understanding of why the appliance failed and a remediation is required. One last note we would like to pass along: when you perform a blower door test, you must perform a positive pressure blower door test. This is the standard test method for all projects. The only time a negative blower door test should be performed is if there is a hazardous situation taking place outside the home that would put the technician's or occupant's health at risk if a positive blower door test was performed. In this case, photo documentation and a note describing the hazard in Vision is required. Participating Contactors should continue to follow the current Energy Upgrade California Home Upgrade brand guidelines and submit any co-branded materials to your Account Manager for review. Currently, the new management for the statewide Energy Upgrade California brand is continuing to update the statewide branding guidelines and will give ample time to contractors to switch over to the new guidelines and logos once completed. Participating Contractors and their staff have access to the online Home Upgrade Learning Center for a variety of free courses! The learning center offers courses in building science and home performance, as well as sales and marketing, to increase knowledge and grow your business. Please take advantage of this free resource. Visit the Home Upgrade Learning Center to view current available courses. Energy Upgrade California® Home Upgrade provides assistance and incentives for home improvement projects that can reduce energy use and make homes more comfortable. This statewide program is managed locally by utilities and regional energy networks and directed by the California Public Utilities Commission in collaboration with the California Energy Commission. Funding comes from utility customers under the auspices of the California Public Utilities Commission. Incentives are offered on a first-come, first-served basis and are effective until the funding is expended or the program is discontinued. Terms and conditions apply. See program rules for details. Programs may be modified or terminated without prior notice. ©2017 Trademarks used with permission and are property of their respective owners. All rights reserved. Greetings to all Participating Energy Upgrade California® Home Upgrade Contractors in the Southern California Edison (SCE) and SoCalGas® service territories. Please take note of several important dates below. Contact your Account Manager if you have questions about any of the topics. Due to the overwhelming success of the program, available incentive funds are depleting quickly. To ensure your customers' projects qualify for incentives, you must reserve your project incentives prior to beginning construction. It is imperative that you reserve your projects and receive confirmation as soon as possible and before you begin construction to protect your company from liability and maintain your good reputation with your customers. Please remember the last day to reserve projects for the 2017 program is September 30, 2017. The program will resume with new funds in January 2018. Multiple project reservations for the same residence (i.e. dual submission) will not be allowed for projects reserved on or after August 15, 2017 in both the SCE/SoCalGas and SoCalGas Programs. For residences seeking credit for multiple HVAC system upgrades, Participating Contractors should submit a single Advanced Home Upgrade project. Renovate America is no longer allowing contractors to sign up for new accounts for Version 1 of Cake Systems. Renovate America will continue to provide support to current Version 1 Cake Systems account holders. Contractors will be able to sign up for a Cake Systems account when Version 2 is released. Please contact your account manager, if you have any questions. The committee is still looking for session topics and ideas! If you are interested in submitting a session proposal that would reflect the best thinking, practices, research and innovation in the field, submit your idea to HPC through the Proposal Submission Site no later than Friday, August 11, 2017 by midnight PT. You can see all the current information here. Before purchasing energy-efficient furnaces, please inform your distributor that you would like to purchase the furnaces without a midstream or upstream buy-down and that the furnaces will be installed in homes participating in the Energy Upgrade California Home Upgrade Program. If your distributor is unaware that you are purchasing a furnace for a customer participating in Home Upgrade, the distributor might apply for incentives through a midstream incentive program. If the distributor receives an incentive in a midstream incentive program, incentives for that measure may not be paid again through the Home Upgrade Program. Be sure to check with your distributor for more information. Please remember to ask your customer about previous participation in other utility incentive programs. Measures they have already received incentives, rebates or direct installation measures within the past five years from any program funded with California Public Utility Commission (CPUC) Public Goods Charge funds are not eligible to receive an incentive again in the Home Upgrade Program. Concerned customers have contacted the program team and utility sponsors because they have not received any notification emails to let them know their projects had been reserved, submitted and approved. To keep your customers informed of the status of their projects, we remind you that it is required to enter a customer email address when reserving the project in the WebApp. Customers whose projects have been selected for inspection also receive a notification email so they are prepared for the QC team to call them to schedule the inspection. Contact your Account Manager if you have any concerns about this requirement. If you have customers who are hesitant about moving forward with a project due to cost concerns, energy efficiency financing may offer an ideal solution. The California Hub for Energy Efficiency Financing (CHEEF) offers Residential Energy Efficiency Loan (REEL) Program, aimed at providing attractive financing options to help residential customers complete more energy efficiency home improvement projects. For more information about this program view details here! The SoCalGas Program requirements and incentives will be revised to align with the Joint SCE/SoCalGas Program for all projects reserved on or after August 15, 2017 and/or all projects post-retrofit submitted on or after October 1, 2017. Information on these changes is available in the SoCalGas August 15, 2017 Program Changes Quick Reference Guide available on the Contractor Website. Burgeson's Heating and Air Conditioning, Inc.
Make sure you include the customer's email address for each project submitted to the program so your excellent work can be recognized, too! Notice: Important Notice: Incentive Funds are Rapidly Becoming Limited, please see the Important 2017 Program Changes email announcement for updated incentive and measure information. Thank you to all the Participating Contractors who attended the Spring Technical Training event on June 6! We hope you found the information on the new BPI Healthy Homes Evaluator certification, Healthy Homes Master Class, Community Choice Aggregators, Contractor Leadership Council, Residential Energy Efficiency Loan (REEL) program updates and QC updates useful as your business heats up this summer. If you were unable to attend, please visit the Past Training Presentations section of the Program Resources on the Contractor Website for a copy of the presentation slides. Be sure to check out the new QC document updates below, and take note in particular of the updates made to the Inspection Guidelines and Processing Guidelines documents. As always, contact your Account Management team with any questions! 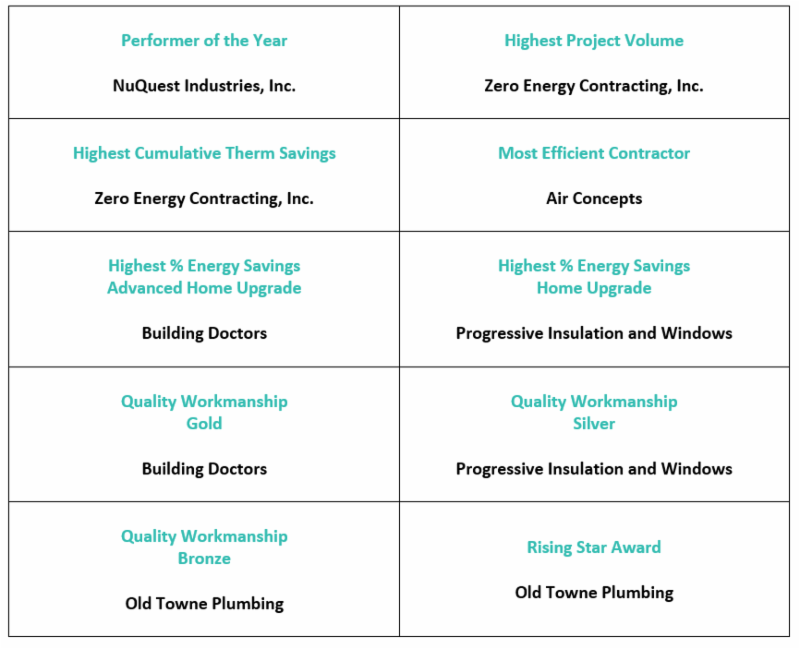 Congratulations to Zero Energy Contracting, Inc. on receiving the 2017 Home Performance with ENERGY STAR Century Club Award! 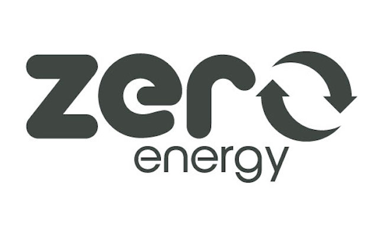 Zero Energy completed 159 HPwES projects in the SoCalGas program last year. The list of all the 2017 Century Club Award winners nationally is available on the ENERGY STAR® website. Participating Contractors in good standing who complete 100 or more HPwES projects in the previous calendar year are eligible for this award, we hope to see your company's name among the winners in 2018. Important Notice: Incentive Funds are Rapidly Becoming Limited: Due to the overwhelming success of the program, the program is now limited in funds. To ensure your project qualifies for incentives, you must reserve your projects to ensure your customer's rebate. It is imperative that you reserve your projects and receive confirmation as soon as possible and before you begin construction to protect your company from liability and maintain your good reputation with your customers. The program will resume with new funds in 2018. Please see the email regarding 2017 program changes for full details. Update on Multiple Projects: Multiple project reservations for the same residence (i.e. dual submission) will not be allowed for projects reserved on or after August 15, 2017. For residences seeking credit for multiple HVAC system upgrades, Participating Contractors should submit a single Advanced Home Upgrade project. The SoCalGas Program requirements and incentives will be revised to align with the Joint SCE/SoCalGas Program for all projects reserved on or after August 15, 2017 and all projects post-retrofit submitted on or after October 1, 2017. Please see the email regarding 2017 program changes for full details. Historic Building Energy Efficiency Program (HBEEP) Participating Contractors can now identify qualifying HBEEP projects in the WebApp for the SoCalGas Program during pre-retrofit in the Customer Information section and post-retrofit submission in the Project Information section. Projects participating in HBEEP will receive 100% of the final incentive in all municipal electric territories. For more information on how you can become a Participating Contractor in HBEEP, please contact your Account Manager. To help ensure account information accuracy, when submitting your project reservations and completing the incentive application for customers with LADWP, be sure to complete the LADWP account information section using the account name exactly as it appears on the LADWP bill. Shortened or alternate versions of the name will no longer be accepted. For example, if the LADWP account name is Thomas Smith, please do not enter Tom Smith for the LADWP account name as it will not pass account verification and will delay your project. This is also strongly recommended for SoCalGas account names (and SCE account names in the Joint SCE/SoCalGas Program). As always, we strongly recommend that you upload a copy of both the electric and gas utility bills when submitting your project reservation to streamline the account verification process. Over the past few months, Richard Heath & Associates Inc. (RHA), the Program's QC Vendor, has been working diligently alongside ICF to develop the tools Participating Contractors need to be successful. This is the time of year we concentrate on updating major Program documentation that is critical to understanding program policies and requirements. Attendees of the June 6 Technical Training were given updated copies of several program documents. The updated documents included: Quality Control Inspection Guidelines Version 7, Quality Assurance/Quality Control Processing Guidelines June 2017, and Version 1.0 of the new Pocket Reference Guide. We are pleased to release these documents, and the Program hopes contractors, auditors, and modelers will find them easy to follow while still providing all the technical expertise needed to navigate the Program. The Inspection Guidelines, Processing Guidelines, and Pocket Reference Guide are available on the Contractor Website. Please contact your Account Manager to receive printed copies of these documents. During this round of revisions, the focus was to transform the existing document into one that more closely follows the steps of an actual inspection in the order the steps are performed. Much of the information has been edited to create a clearer, more concise document designed to be easier to follow. These and all other changes to the Inspection Guidelines may be viewed in the detailed document Inspection Guidelines Changes for 2017 V7, available on the Contractor Website. The Processing Guidelines document narrates Program rules that Participating Contractors must follow. The Processing Guidelines indicate how a project is processed when a particular issue is encountered during the inspection or the review of a project. This document contains sections including: application phase processing, appeals, pass with recommendation issues, remediation required issues, fail issues and more. The pass with recommendation issues and remediation required issue sections are important since they tie into existing and potential health and safety issues. Those sections contain specific conditions commonly encountered in the field that may require further attention. Example: You are participating in a Witness QC and the Energy Field Technician informs you that the fireplace with the gas log set does not have a damper clamp installed. What do you do? Open the Processing Guidelines and look in the Remediation section, on Page 7 you will see Item 6, "Gas-fueled fireplace does not have a damper clamp installed." In the beginning of the Remediation Required - (Withhold Payment) section on Page 7, contained within the first paragraph is the following statement: "to qualify for payment, non-conforming condition(s) must be remediated." Therefore, you must install a damper clamp and provide a date-stamped image to the Program to confirm it was installed. The Pocket Reference Guide, or PRG as we call it, is brand new to the program. After hearing many requests from contractors and auditors looking for a quick reference guide of the most common issues addressed by the Inspection Guidelines, the Program developed this document as a resource that can easily be stashed in a shirt pocket or tool box. Contained within its 54 pages is an abundance of easy to find procedures, guidelines, tables and formulas. If you have a question while on the job, there's a good chance you'll find an answer in the PRG. It was printed on heavy synthetic stock to ensure the document was durable and built to last in the field. 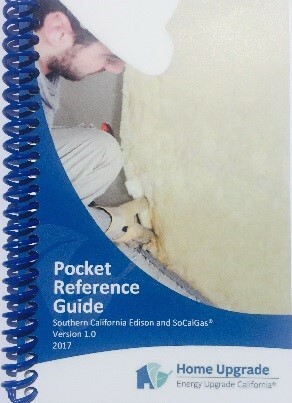 Please remember the Pocket Reference Guide is not designed as a replacement to the Inspection Guidelines; it is meant to be used in conjunction with other program documents. Please Note: During RHA's presentation at the Technical Training workshop at the ERC, a statement was made regarding Condition Code Reference #1 on the Notice of Field Identified Recommendations (NFIR) form. The presenter pointed out that the building air leakage value of ≥0.35 ACH was incorrect and should be changed to ≤0.35 ACH. It was also pointed out that this value was incorrect in the Inspection Guidelines; page 86, section B., #1, a., and the Processing Guidelines; page 5, section G., #1. After further review, it was determined that the original value of ≥0.35 was correct in all of these documents. If you made a note to change these values on any of the documents, please be sure the original value of ≥0.35 is being used on all the documents. We apologize for any confusion this may have caused. The Energy Upgrade California programs are rebranding with a new logo, campaign and statewide website. We will notify you when Home Upgrade will be incorporated into the new website. The current Home Upgrade logo featuring the leaf/house is approved for use by individual programs and Participating Contractors through the end of 2017 - please continue to use current program marketing materials and continue to share any co-branded items with your Account Management team for approval. Please hold off on any large investments such as car wraps that feature the Home Upgrade brand. The new circle logo is not yet approved for use by programs or Participating Contractors until a new brand sublicense agreement is in place. We will keep you updated as more information on the rebranding effort becomes available.